This week's Vintage Love features Kelly from High Street Market. Kelly's shop is a beautiful assortment of curated, vintage pieces. I love the collection of silver pieces she has available! She also has an equally wonderful blog that, like a good book, I have not been able to stop reading since I discovered it! 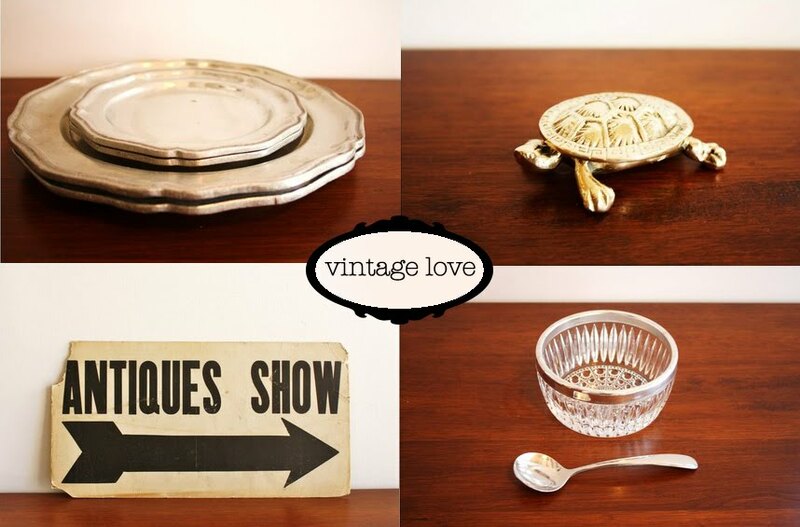 The vintage items that I sell in my shop stand the test of time - they will never go out of style and I love that. I believe that antique items bring a sense of personality and interest to your home unlike any other "new" accessory can. It is these treasured pieces that really help define your personal design style, and (bottom line) you won't find them in other people's homes; they are uniquely yours. I also love the romance of an older piece - "Who owned this before me?" "How did they use it?" I think, "They must have taken good care of this because it's in mint condition"...all those fun thoughts run through my head. What's the best thing you've ever come across when you have been vintage/thrift shopping? The best item I have ever found is a large, painted, wooden zebra. It's about 2' long and he is laying down...he would be perfect for a large entry table. It may have originally been used on a carousel or as a decoration in a circus...I can't be sure but I love it. It's totally weird and off the wall, and that is what I love about it. Not really. I just show up with a lot of money, many MANY tote bags (in hopes of filling all of them) and hope that I find something good. It's really a weird thing - never knowing what you might bring home. Thank you Kelly for participating in this week's Vintage Love. Photos courtesy of Kelly, High Street Market. Kelly's blog brought me over to see you here. And I like the view a lot. Welcome!! So glad you like the blog! !